When Will U.S. Sport Horse Breeding Get Its Due? Wendy Webster’s W2 Holsteiners in Penngrove, Calif., is home to the stallion Hunter, a son of the prodigious Heraldik whose offspring have won Olympic eventing gold. When the Holstein Verband tried to buy Hunter back for its breeding program in Germany, Wendy declined, believing that the horse could be a game changer for U.S. sport horse breeding. While he has sired several successful three- and four-star horses, top riders continue to automatically default to shopping in Europe for young prospects rather than exploring domestic-bred options, while equestrian governing bodies de-prioritize the role that a thriving breeding program could play in upping the U.S.’s performance on the world stage. Wendy kindly shares her perspective of the system, looking from the inside out. James Alliston and Happenstance (Hunter X S’Brina, by Ramirado), who recently won the Galway Downs CCI3*. Photo by Shelby Allen. In the highly popular sitcom Big Bang Theory the female lead character, Penny, an aspiring actress, is convinced if she could just get one part in a movie she would be launched on a career path to stardom. As a sporthorse breeder I also have had the dream that one horse from my program would trigger interest in my horses by event riders from throughout the country. I nurtured the dream of breeding horses from the time of my first riding lesson at 6 years old until I turned 30 and, while pursuing a career in finance in San Francisco, was able to purchase a small farm in Northern California in 1985. As a teenager in Massachusetts I had owned an Appaloosa who, despite the nasty habit of turning his head to bite the leg of the rider in the saddle, became a winning competitive trail horse, terrific foxhunter, 4-H project and talented jumper. I began my breeding program crossing Thoroughbreds with Appys and evented my breeding stallion through the Preliminary eventing level. One of my horses from this period sold to Jacques Dulcy, member of the French Olympic eventing team that competed in Atlanta. Local sales were discouraging, however, so I switched to breeding Holsteiners in the early ’90s. I knew little about Holsteiners but studying the history of the breed and its performance success made me a convert. One of the first Holsteiners that I bred from a distance running Thoroughbred mare crossed on a Holsteiner stallion was named Le Samurai. “Sparky,” as he was known around the barn, competed in Europe at the three-star level with Amy Tryon, finishing 5th at Blair Castle in 2005 (the internationally published results for the event listed Sparky as a “French bred TB” despite the Holsteiner brand on his hip!) His results earned me the title of USEF-PHR Leading Breeder of Event Horses for that year. I attended the USEF convention and heard David O’Connor announce my name as winner of the award. Could this be the turning point for my business? After all David O’Connor sourced event horses — now that he knew my name maybe he would reach out or recommend my breeding program to horse shoppers? Le Samurai would go on the following year to hold the lead in the Kentucky four-star before a catastrophic injury ended his life at the last cross country fence. In my pursuit of better breeding stock I traveled to Germany 20 times in the course of 16 years. In 2001 I purchased a 2-year-old stallion, sired by the TB Heraldik out of a Holsteiner mare with blood of Alme and Ladykiller (TB), by the name of Hunter at the annual Holsteiner stallion approvals. Hunter as a 2-and-a-half year-old in Germany. Photo courtesy of Wendy Webster. Hunter as a 5-year-old in California. Photo courtesy of Wendy Webster. Heraldik had been brought to Germany several years earlier from the Czech Republic where he had been a Grand Prix jumper. 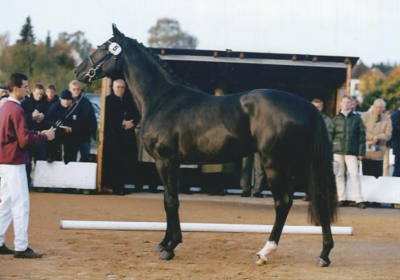 While many German breeders applauded Heraldik’s type, gaits and performance, a relative few used him for breeding, waiting to see what he produced for others. What he produced became legendary — at the Hong Kong Olympics in 2008, the gold medal winning German eventing team included the two Heraldik sons FRH Butts Abraxxas, ridden by Ingrid Klimke, and FRH Butts Leon, ridden by Andreas Dibowski. 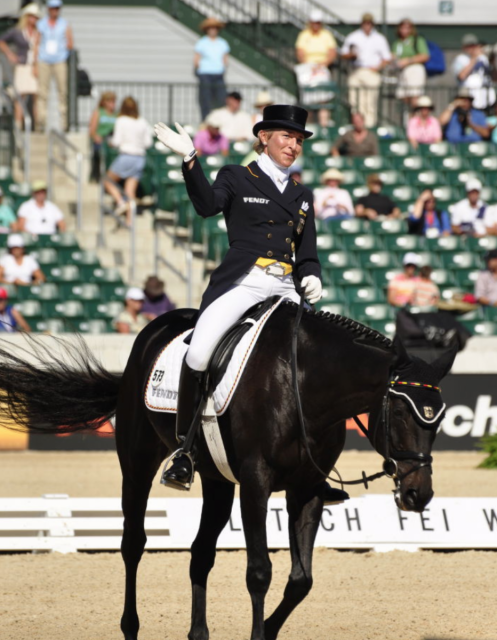 Ingrid Klimke and FRH Butts Abraxxas at the 2010 World Equestrian Games in Kentucky. Photo by Leslie Threlkeld. Andreas Dibowski and FRH Butts Leon at Aachen 2013. Photo by Jenni Autry. Sadly Heraldik himself had passed away some years earlier but his offspring proved indomitable in eventing. As a sire Heraldik is named in the top five eventing sires worldwide for a record 13 consecutive years by the World Breeding Federation for Sport Horses. Given the relatively few stallion sons of Heraldik in existence, the Holsteiner Verband expressed interest in getting Hunter back for its breeding program in Germany. It was a hard decision but in the end Hunter stayed in the USA with great hopes that he would lead to a surge in the production of top level eventers here. Was this going to be the catalyst to put Hunter’s offspring in great demand? I had also selected a number of young mares to add to my broodmare band on my German trips. One 2-year-old that I purchased I named Lady Calido. I trained her as a jumper and had several foals out of her before she sold to Robyn Fisher at age 8. Robyn started eventing the mare shortly after purchase and she went on to be Preliminary Horse of the Year, Intermediate Horse of the Year and a three-star winner. Maybe this was the horse to bring me new clients? Another mare from my breeding program, through an odd set of circumstances, ended up in Boyd Martin’s barn. He completed 21 events with Charla through the Intermediate level with zero jumping faults. Was this the horse to put me on the radar of riders? Sadly, just before her two-star debut she perished in the Pennsylvania barn fire. 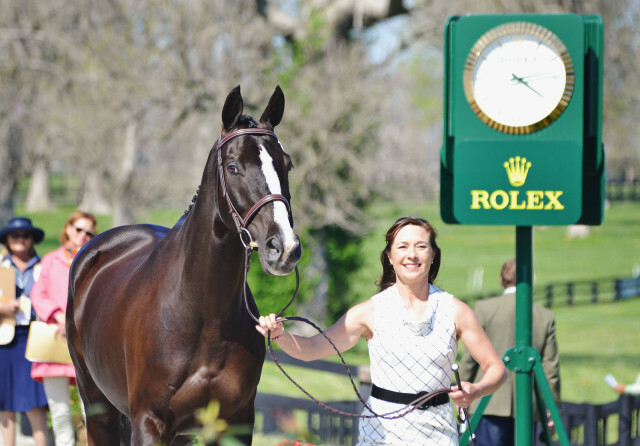 In 2014 the Hunter son High Times made his debut at the four-star level in Kentucky after learning the sport over the years with Jenn McFall in California. They completed the weekend in 36th and returned in 2017 to complete again, this time in 24th place with one of the few clear rounds in show jumping. Jen and High Times at Rolex 2014. Photo by Jenni Autry. Another Hunter son is the three-star winner Happenstance. He came up the levels in California with Matt Brown and completed several three-star events on the East Coast including a 4th at Fair Hill and 5th place at Jersey Fresh in 2015. 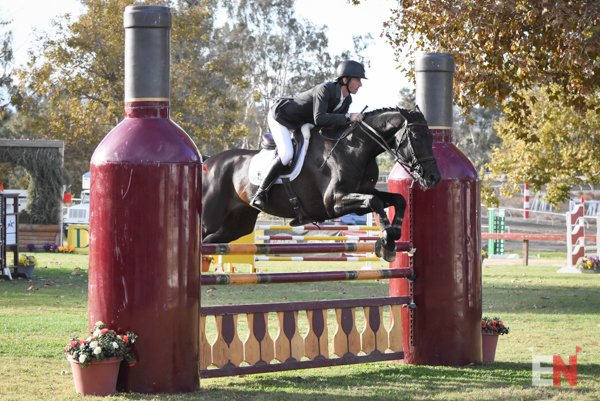 Now ridden by Brit James Alliston back in California, the horse has won his last three events: Twin Rivers Advanced, Woodside International CIC3* and the Galway Downs CCI3*. Is this the horse who will lead riders to desiring Hunter offspring? James Alliston and Happenstance at Galway Downs 2017. Photo by Shelby Allen. 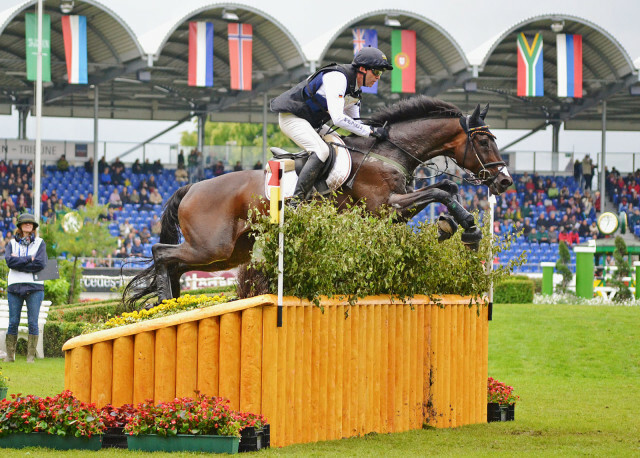 In 2015 based on the results of his offspring competing in the FEI levels, Hunter was ranked in the top 100 Eventing Sires in the world by the WBFSH. 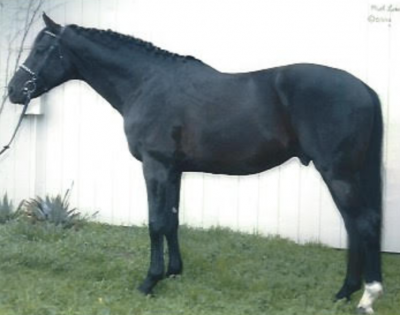 He was the only warmblood stallion based in North America to make the list. Kelly Prather, a talented rider who was based only a few miles from Hap’s home. After Kelly left the area, a chance meeting at a local pizza parlor with Matt Brown led to him taking up the reins on Hap. Recently I contacted five West Coast eventing trainers about forming a partnership in a 7-year-old that I bred, a full brother to High Times. Four of them had no interest; in fact, one trainer told me she would not look at a 7-year-old who was not going at the Preliminary level at least. As a breeder I am more concerned about allowing my youngsters to grow up and mature mentally, not pushing them in competition before their bodies and minds are ready. Since I have created them I feel a responsibility to watch out for their welfare just like a parent does with a child. A sound, happy horse can continue to compete well into its teens; however a “broken” horse will have few options for its future. Back in the mid-’90s the Jockey Club developed a plan to track the sport results of Thoroughbreds after their racing days were over as well as horses that were at least half-Thoroughbred. They called it the Performance Horse Registry, and as a member of the Holsteiner Horse Association Board of Directors I remember we had several long discussions about supporting the endeavor as we were keen to start the process of recording which horses bred in the USA were consistently successful. After some years the PHR was handed over to the USEF to manage. Sadly, the USEF announced this year that they are dropping the program altogether after it never really got off the ground. So in 20 years we, as U.S. breeders, are still at a point of not knowing the success rate of what we produce or which breeders are consistently hitting the mark. While the USEF tracks some results in equestrian sport their system has flaws. Take for example the German National Federation system, which assigns a Life Number to a horse when it begins to show. Every single result from competition in Germany for that horse is recorded regardless of who rides the horse or who owns it. The USEF requires the owner of the horse to be changed/recorded each time the horse is sold in order for horse’s results to be kept. There are owners who really do not care about the points the horse may be earning and never bother to file a change form. I have personally spent hours tracking down owners and begging them to record the current ownership so that results will be tallied. All the information on horses who have incomplete paperwork is lost. If riders do not have the facts on which U.S. horses are genetically favored to go to the top of the sport it seems they will continue to do their shopping elsewhere. This situation presents a conundrum already pointed out by a number of top U.S. equestrians. The Europeans are not going to sell us their best horses. The horses that are sold to the U.S. can prove to be very unsuitable once they arrive stateside. 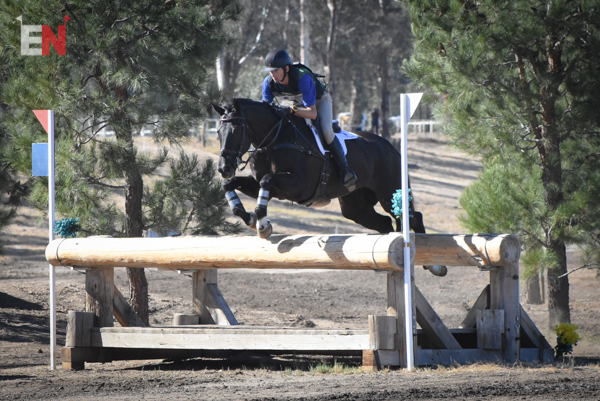 The California eventing community is thriving and there are those who venture to the UK on a regular basis to procure equines. I have heard of four horses who arrived in the last two years who have serious health or temperament issues and have not been suitable for the purpose initially purchased. Very sad to think about all this disappointment when there are talented, reasonably priced sporthorses with proven genetics available from U.S. breeders. So, as the sitcom Big Bang Theory winds down its production, will Penny finally get her movie deal? Only time will tell.